Bringing your own device also known to some of us as BYOD is an initiative that has been gaining a lot of attention from businesses around the world. By all accounts, BYOD is something that is here to stay and since we have all entered the era of collaboration, this is one approach you must implement. Most of the small businesses, whether they begin at a fresh stage or have established already, must have a good idea about the implications of BYOD and see how it may work best for all employees. In this post, we are going to tell you a lot about BYOD pros and cons. In this section, you will learn about the several advantages that come with BYOD in the workplace. Though the model of BYOD may expect you to have a proper upfront investment initially, always remember that it will be far more cost effective later on. When you say yes to such an approach or policy, the businesses shall make changes in the hardware cost, data and voice services along with other ones for all users. And when you do that, the businesses will be able to reduce all expenditures on a monthly basis. Even though businesses don’t have to pay any of the extra charges that are associated with the hardware and service, it becomes the responsibility of the employee. And even though it seems a little harrowing, several employees will be happy to foot the bill since they can use only that technology that they are comfortable with. Another advantage of BYOD is that there will be more satisfaction among the workers. They will be happy paying for their own needs and services since they will be able to use the hardware of their choice. The method will use this preference to get rid of stress and have an environment that is completely new and is operating properly. In doing that, the method will look for much bigger satisfaction among its workers. There are times when employees tend to feel a much bigger sense of trust among companies that will allow BYOD. This will lead to a better working environment that will boost morale and loyalty. With BYOD comes satisfaction and efficiency. When you adopt such a method, the employees will be able to use them whatever the devices may be or are comfortable with. Since most users are well aware of how they can navigate such devices, they are able to perform tasks in a much quicker and faster way which could have otherwise taken a longer time in other devices. With BYOD comes a whole lot of mobility. Since employers may use their own devices, they are also able to move them in a much faster and easier way. BYOD with other connections will also allow you to have office connection almost anytime and anywhere. An employee may also access the network of the company from their own device through the connection of the desktop. This will allow the employees to get hold of information about the company as well as applications at any place or point given. Even though there are a few BYOD security issues, there will be some precautions that must be taken. When you have BYOD and some of your employees, you will also be able to use all tools that are needed to get work done faster. For example, the manager of a certain department can respond in a much more robust manner and will be able to keep tabs on all opportunities by using BYOD so that the best can be retained and attracted in the long run. In another case, the business managers who carry such devices into all meetings may act on a document on the request and changes that need to be made and speed the delivery of the projects. This will also result in having much bigger projects which are delivered and developed in a tight workflow. The bigger picture is that productivity shall be boosted and revenues will be increased. The IT managers must always retain the total control they have over infrastructures, security and network issues. BYOD will also handle the puzzle for their IT manager so that the data has been safeguarded against all issues of security. For example, a BYOD policy may cover which of the devices may or may not be used by the staff and what data must be transferred, wiped or stored. You can have control over the IT strategy which is opposed to all employees and contractors who may take some interest in the BYOD approach. You will be able to work from almost anywhere by using the same device whether it comes to personal uses or even business. This will relieve you from carrying too many mobile devices for the sake of personal usage. Issues may arise here that will irk the employees but that can be solved as well. Now that you know the advantages of BYOD at your workplace, take a close look at some of the disadvantages that come alongside. The sad part about BYOD is that it may not be compatible for a few users. Some people actually have first hand experience when it comes to this. They found out that a proper and useful software has to be used so that it become compatible and easy to use. The network is sometimes locked which makes things difficult to use. It is almost the case of having water everywhere with literally not a drop to drink. We have to make the right choice to keep aside the good phones in order to try out its service. 2. You have to become more tech savy to be able to use it. The savings that you get out of buying your own device might not be worth if in case you cannot find out how to program the phone you are using. You are also expected to know how you can shop for the best phone. You may end up getting a great deal of discount on a phone without realizing that it is almost the end of life as well as support from the manufacturer. You must have a good idea about the features and how they work so that you are able to use it faster. When you get programs free such as Eyebeam Lite, you might want to download them thinking they are easy when that is not the case at all. They are not in the least fun to use. In case you don’t possess a proper headset or device, you will soon find out about the sound quality which is severely lacking. Having a proper mobile app on the cell phone is cool but you must also have your limits. When you say yes to a BYOD provider, you will also be able to purchase or probably lease the phones at the same time from them. At least two or three years later, there will be new technological breakouts that will make the phones outdated. Some VoIP providers will let you also trade in some old equipment for discounting new ones. Finally, you must know that BYOD trends could be a great distraction. After all, it will become a primary device. Therefore you have to be extremely careful before using the approach. Yes, it is a great option for people who are tech savy but don’t forget what a waste it would be if you are spending time on the phone all the time. After all, that is what BYOD usually does. It takes up extra time and space, something you surely don’t need. Even though BYOD can boost mobility and allow the employees to do better work at home as well as office, you must always remember that blending of such interests is not always the best of a safest idea. We often end up with a laptop or mobile phone addiction when we work with BYOD all the time. This may actually go back to the concern which is related to IT control that also again goes back to security since devices which are used privately and professional are more susceptible to bigger risks. Therefore the businesses have to implement the usage policies for the employees so that conflicts can be avoided later on. Does BYOD Empower your Business? It is quite clear from the post that we have read above that BYOD is both a business strategy as well as a technology. Because we have a good understanding of all these demands, several small owners of the business do recognize the requirement to own the BYOD and harness all of its positive effects. One of the best benefits of buying your own device is that you will be able to make the workforce far more agile and the business networks will become more secure. When it is planned properly, the results will be more transformative and powerful. 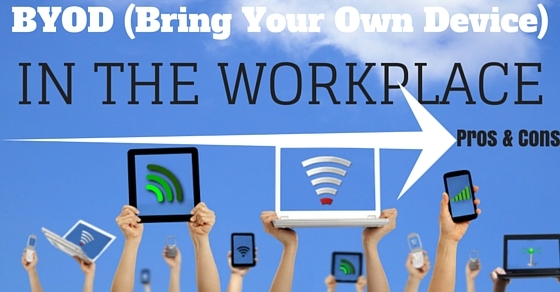 How can you Establish BYOD at Work? In order to establish BYOD at work, you must first and foremost speak about the devices which will be permitted in the workplace. Discuss what do you mean by bringing your own device. Whether people are allowed to bring just phones or phones and tablets or both, you have to make it a point to discuss all of this with those who are working under you. Only then can the policy work. Also, make it a point to discuss who will have control over the personal information that is stored on the servers. When you are wiping your phone, all the content on the phone will be erased including all pictures, applications and music. Sometimes it will be literally impossible to get hold of these items again. Therefore it would be wise if you discuss this topic with all the people who are working for and under you. BYOD could be very advantageous if you have a good idea of how it is done. The method has to be monitored and utilized properly for long term benefits. Even though it has a few potential concerns, there are some resources that are attached to these. To make sure it has been optimized to its fullest level, it is important that the company using the model is fully aware of what is needed. While the information above does come with a few pros of BYOD, it may not be inclusive holistically. BYODs adoption has to be more individualistic and so companies must research all the information before selecting the model. The approach of bring your own devices could have great benefits towards the growing company. Several employees have already admitted they will check all of their smart devices that will work daily, even once every day. Also, there are a few negative points attached to the system that you should be mindful of. If you want to take this method up in the future, do consult your clients about it. They can help the business grow and profit tremendously in the long run. Also if you have found some benefit of BYOD from reading the post and would like to tell us about it, do drop a comment below. We would love to hear.